We are as excited as you are to be able to finally bring this event to life and while we do appreciate your interest in this cruise, we may have to apologize in advance that we are not able to reply to each and one of you. Having this said, we have during the past hours compiled a quick Frequently Asked Questions which will hopefully bring some light among the Waves of Darkness. ✔️ On Friday the 29th of March at 12:00 Central European time. ✔️ The prices vary depending on how many people are sharing a cabin. To give you an idea about the prices we can say that if 4 people are sharing a cabin without sea view the price per person would be roughly 90 euro per person, our cheapest tickets. If 2 persons share a cabin with sea view the price will be roughly 125 euro per person. The cheapest single bed cabin starts at 145 euro. ✔️ All tickets include accommodation. So, you do not have to purchase a separate ticket for the festival. ✔️ All cabins have private toilets. ✔️ No, only one of you must make the reservation if you want to share the cabin. Upon booking the tickets you need to know the full name of the passengers, as well their nationality and birth date. ✔️ If you for any reason are not able to use the ticket, you may sell or give away your ticket to somebody else. After selling the ticket you need to get in touch with Tallinksilja and ask them to change the name on the booking. The name change is free of charge. ✔️ While we cannot guarantee you that you will not get motion sick, we do expect the people to look a bit into the facts before starting to complain that the event is taking place at sea. Firstly, we’re talking about a huge vessel, almost 200 meters long and 30 meters wide. The larger the ship, the less the chance that you will feel anything. If you do discover that you feel sick, there are motion sickness-pills available at the reception that is open 24/7. ✔️ Secondly, mid-September is usually the end of high session on the Baltic Sea. Thousands of passengers cruise these waters every day at that time of the year and sea storms are very seldom. We do hope for great weather so we can use the sun deck, but the concerts are not influenced in any way by the weather. The concert venue, Starlight Palace has direct access to the side deck, so you can always go out for a smoke or for a drink outside. ✔️ Some people are asking what the point is of being at sea, if we’re going to be inside anyway. Well, the point is that we will be moving and it’s hard to ignore that fact when the venue has large windows on both sides. Moreover, isn’t it fantastic, that we can do all this, while moving and be just a few meters away from everything, restaurants, bars and even your own bed? ✔️ Finally, we encourage non-believers and people that are afraid to stay home. This is a special event done under special circumstances. ✔️ By following the link bellow you can find information regarding the different types of cabins available, the restaurants and bars on-board, spa and other facilities. Yes, there will be vegan and vegetarian alternatives and the bar prices are lower than in Scandinavia. ✔️ The boat departs on Saturday the 14th of September at 5:00 PM. However, the check in is closing one hour before departure so you must be checked in by 4:00 PM. ✔️ The boat docks in Riga on Sunday morning and it is anchored there from 11:00 am (local time) to 5:30 pm (local time). This means that you have about 6 hours to explore the Latvian capital. Make sure you’re back at the terminal in Riga by 5:00 PM. ✔️ There will be no concerts onboard during day time. Concerts start in the evening around 7 PM. ✔️ The boat gets back to Stockholm on Monday the 16th of September at 10:30 AM. ✔️ In other words, this is a short cruise from and back to Stockholm, not a one way trip to Riga. ✔️ There is no point to announce it way in advance for the simple reason that once on-board you cannot leave. Secondly we want to avoid schedule change announcements. So, it’s best to wait until our crew, the boat crew and the artists have confirmed the logistical details around the event. You cannot buy a one day ticket only. The tickets are valid for both evenings. 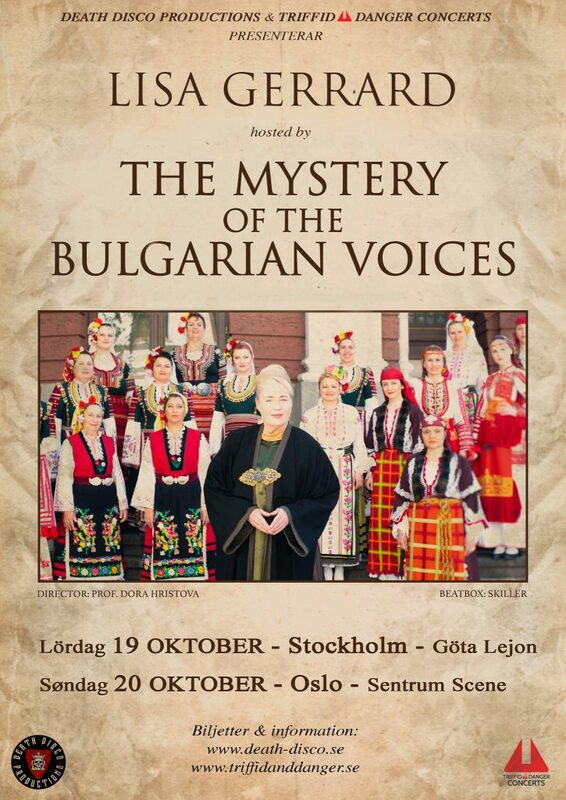 You may go off in Riga, but you cannot join the festival in Riga if you have not checked in Stockholm. ✔️ Yes, access to the concert venue is not possible for people under 18 years. 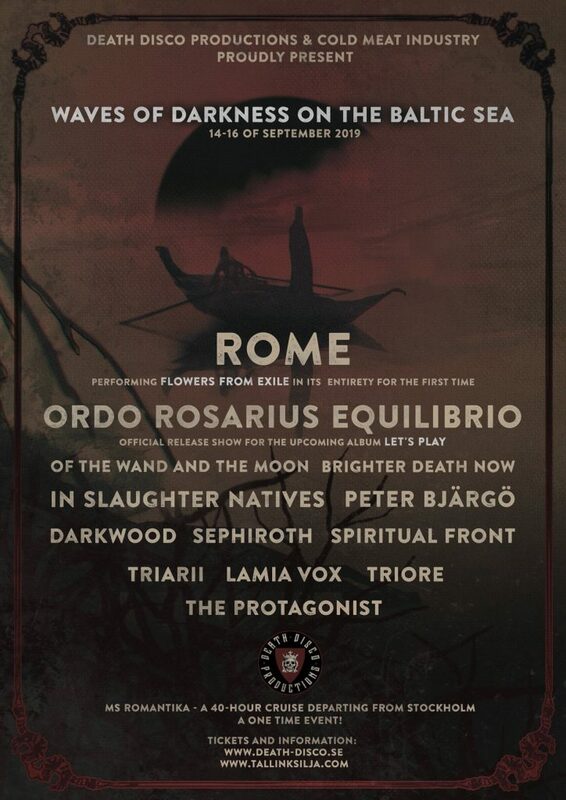 This is it, an event that we’ve been working on for more than half a year and we can now finally reveal it: WAVES OF DARKNESS ON THE BALTIC SEA! So, we decided to take it to the next level and as crazy as it sounds, we’re moving the festival to the sea! We are excited to be able to present for you our final project of this kind, once again in conspiracy with Cold Meat Industry. The cruise ship, M/S Romantika, departs from the waters of Stockholm on Saturday the 14th at 5:00 PM and it returns to Stockholm on Monday morning at 10:30 AM. You may choose between different cabin categories, prices vary depending on how many people share a cabin, with or without sea view. Tickets on sale starting this Friday! 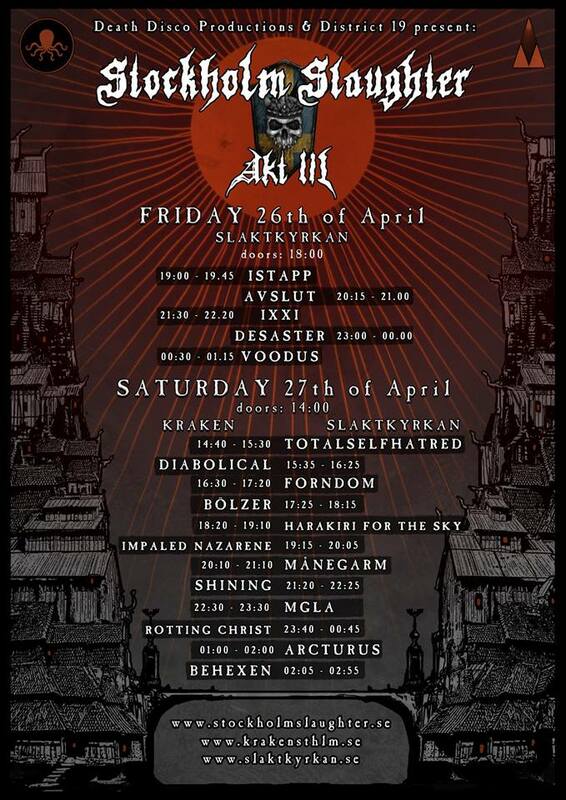 We can now finally reveal the running order Stockholm Slaughter: Akt III. As previously announced, we will not have any overlaps. 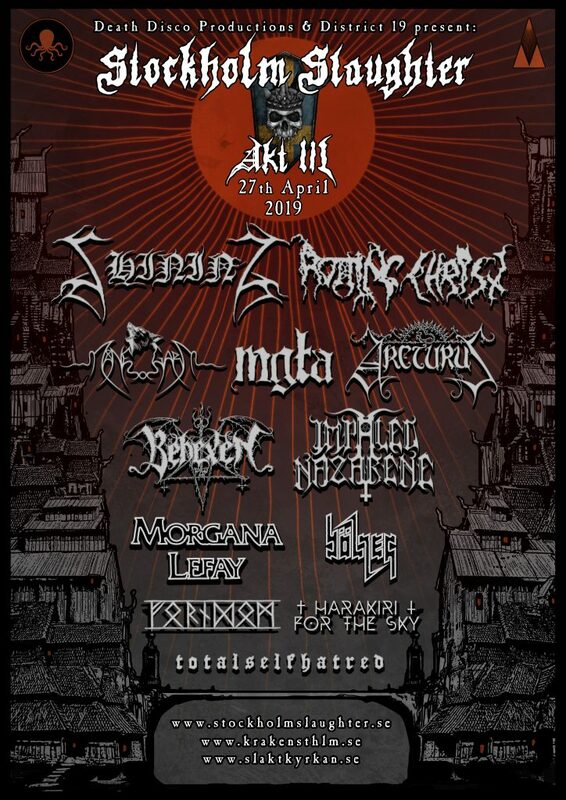 In practice it also means that we strongly recommend to those that wish to see entire sets of bands that are to perform at Slaktkyrkan, to be there in time in order to avoid long waiting lines at the entry. We will send an email with all practical info a few days prior the festival as well as share the most important info here, please have patience. Some of you might notice that Morgana Lefay is not on the poster any more. Earlier this week we have been informed by the band that they have (once again) decided to take a break so for now it is unsure when or if they will ever perform again. This having said we’ve managed to get a replacement in the form of the Stockholm based Death Metal act DIABOLICAL. Less than 200 tickets available for Saturday so do not wait if you want to make sure you can get in! Främst känd som den gudomliga kvinnorösten i Dead Can Dance samt för soloskivor och soundtrack såsom Gladiator – plus ytterligare samarbeten med mästerkompositören Hans Zimmer – har Lisa Gerrard karvat ut sin egna stil. Kören som ackompanjerar Lisa på denna turné är känd över hela världen och har genomfört fler än 1250 konserter i de mest prestigefyllda konsertlokalerna jorden runt. År 2018 gav kören ut sitt första studioalbum på över två decennier: BooCheeMish. 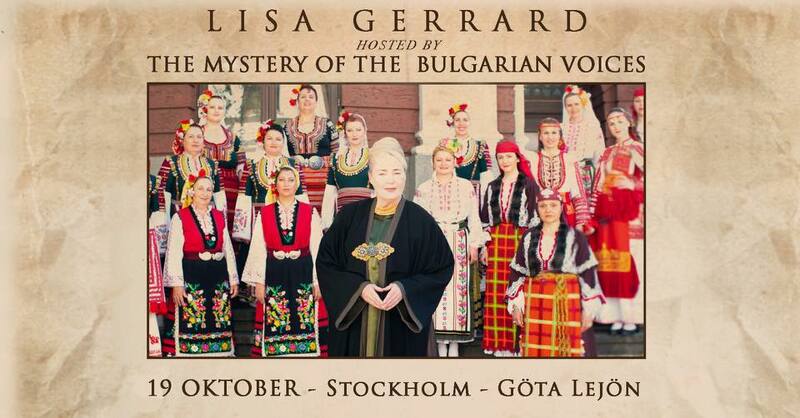 ”Mysteriet” ligger i hur de lyckas kombinera diafonisk sång med dissonanta harmonier till att frammana en rent hisnande ljudbild, och med Lisa Gerrard i sina led vågar vi utlova en oförglömlig afton!